Apple today fixed too many bugs on the iTunes version 10.4 release by pushing Apple iTunes 10.4.1. Apple iTunes 10.4.1 support OS X Lion’s new full-screen app capability, which allows you to use iTunes and other apps without distractions. Navigate between your full-screen apps with a simple gesture. 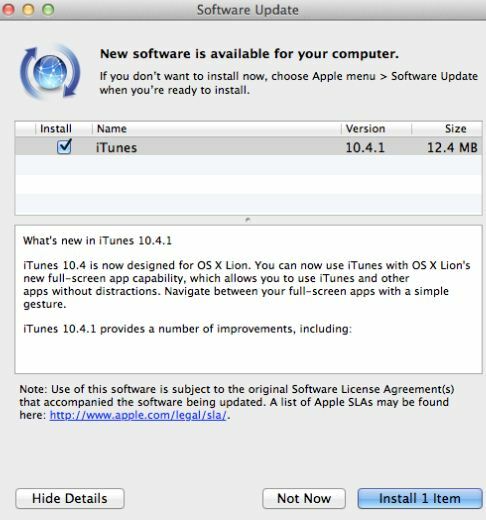 Apple iTunes version 10.4 need only 12 MB update to Apple iTunes 10.4.1 if you are updating through software update and it you doing it through Apple iTunes update website, iTunes 10.4.1 file size is around 78 MB for windows OS and 91 MB Mac OS respectively. Fixes a problem where the media keys on some third-party keyboards work inconsistently with iTunes. Addresses issues with adding artwork to songs and videos. Resolves an issue that may cause iTunes to become unresponsive when purchasing an HD movie. Fixes a problem where iTunes may take longer than expected to open after waking your Mac from sleep. Addresses issues with Voice-over support. You can update to Apple iTunes 10.4.1 through Software update or through the iTunes 10.4.1 update page.You can download Apple iTunes version 10.4.1 from below link. Download Apple iTunes 10.4.1 for Windows and Mac from here.